4. Development of Next-Generation Technologies | Value Creation Model | Corporate Information | Akebono Brake Industry Co., Ltd.
We are developing technologies for various themes, such as safety, the environmental friendliness, and comfort. Akebono promotes the development of products with a lower environmentally hazardous substance content. In accordance with in-house guidelines on brake raw materials, stricter than required by law, Akebono does not use these materials or changes to alternative materials. Akebono Research & Development Centre has developed a new solid lubricant material that improves the performance of friction materials at high temperature ranges. 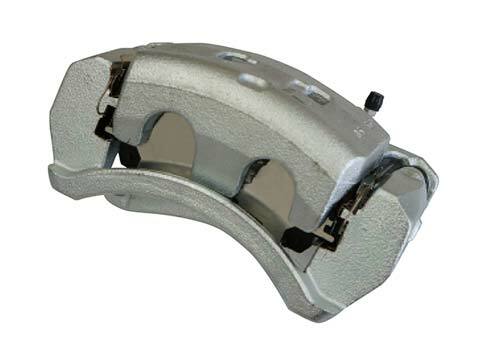 This material contributes to superior friction performance as well as helps prolong the product life of brake pads to contribute to resource savings. Hereafter, we will use this material not only for automobiles but also for other fields. With increasing use of electrical systems in automobiles, we aim to create people- and environmentally-friendly brake products that do not emit brake dust or noise. With this in mind, the Akebono Research and Development Centre has been jointly researching and developing Magneto Rheological (MR) fluid brakes, new concept electrical brakes that do not rely on friction, working with the Institute of Fluid Science, Tohoku University (Professor Masami Nakano). In California, U.S.A., friction materials containing more than 0.5% copper will be prohibited from being applied in new vehicles beginning in 2025. At Akebono, the departments involved in the production and distribution of friction materials are working together globally to comply with the new law and Akebono has already developed friction materials that satisfy the law. Electro-Mechanical Brakes employ an electric operating mechanism to press the disc brake pads. The brakes help to improve fuel efficiency by reducing vehicle weight. Moreover, they are environmentally friendly because they do not use brake fluid, which must be properly disposed of whenever repairs are made. Akebono will continue to contribute to environmental preservation by working to develop electro-mechanical brakes. The low drag caliper incorporates specially designed components to ensure that the pad to rotor gap is precisely maintained at the micron level. This reduces brake drag due to contact between the pad and rotor when the brake is released, contributing to improved fuel economy. 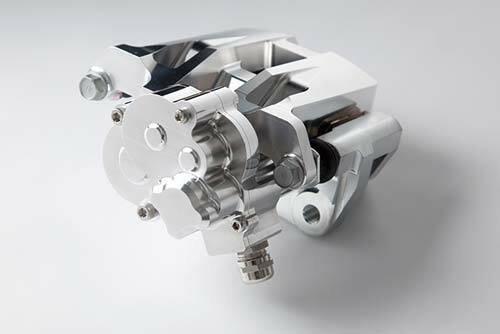 Akebono continues to achieve technological breakthroughs for mass production brakes utilizing technology accumulated through high level motorsports. For example, our weight-saving technologies will help enhance fuel efficiency and thereby contribute to lower energy consumption for automobiles. Furthermore, by participating in endurance racing, we will advance technologies for the greater wear performance of brakes in heavily loaded conditions. This will, in turn, help us create products with a longer life while helping to save resources. 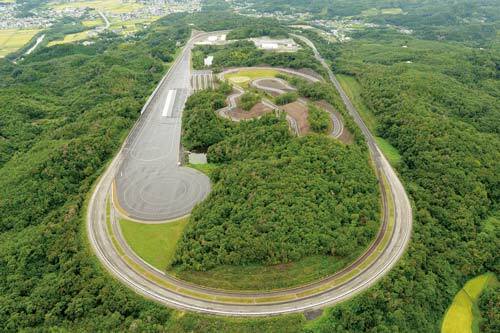 Akebono’s proving ground, Ai-Ring, is one of the largest in Japan for an auto parts maker. It has undergone a course upgrade complete with winding roads and other features. In recent years, auto parts makers have had to keep pace with rapid changes in the automotive market and address the needs of new mobility in society. While deepening its understanding of structural changes in the automotive sector and new functionalities, Akebono aims to improve its development competitiveness by developing brake experts who can react quickly to market change. In Formula One, it’s necessary to have brakes that allow the car to go faster. When entering a corner, vehicle speed changes from 300 km/h to 80 km/h in a matter of three seconds. At this time, brake rotor temperatures rise as high as approximately 800°C. To provide minimum possible weight while keeping high rigidity, outstanding cooling capacity, stable performance and high reliability, our meticulous design processes take into account materials selection, their surface treatment, and multiple other aspects. 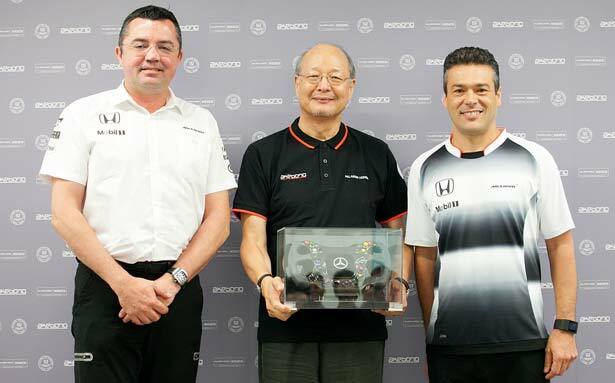 After the 2013 season, Akebono and the McLaren announced a new, extended technology partnership for even closer collaboration. In 2016, Akebono held a commemorative event to mark the 10th anniversary of their partnership. 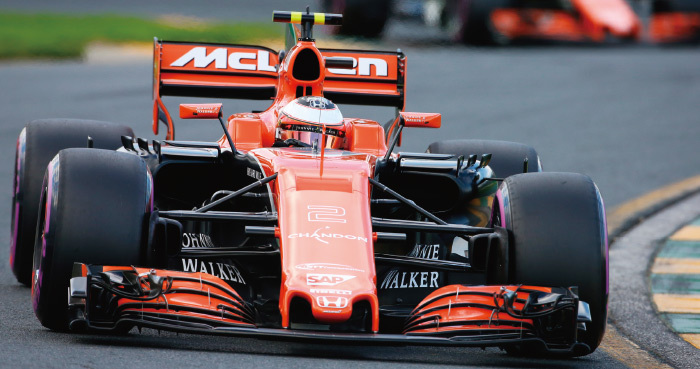 In the past 10 years, we have learned a lot from McLaren in the improvement of our technical strengths. 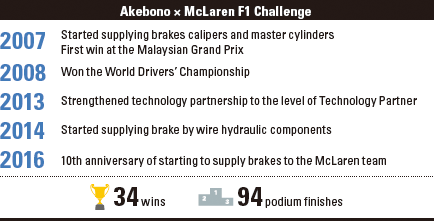 The various technologies accumulated through our involvement in the F1 challenge, such as weight reduction, high rigidity, cooling capabilities, and so forth, have been introduced into our high performance brake business along with the experience of our individual engineers. In the 2017 season, the regulations for cars were changed significantly. With these changes, lap time is expected to decrease. Akebono will make every effort to supply the highest performance as requirements on brakes continue to increase.